There’s nothing more mouth-watering and filling than true authentic barbeque. 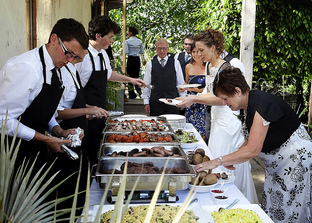 With our superior catering services, Niagara Catering is your provider for amazing, great tasting barbeque. Let us serve at your next event, and our barbeque is sure to be a crowd pleaser. Our dedicated chefs are masterfully skilled in the most traditional and trending barbeque techniques to bring great flavors and sauces together for a dynamic punch. From our delicious meats, to perfect sides you’d expect with barbeque, we aim to provide an enriching and tasty experience for our clients. Because we know not every person’s preferences are the same, we also offer gluten-free, diary-free, and vegetarian friendly dishes at your next barbeque. Our sides include mac n cheese, traditional mash potatoes, scrumptious coleslaw, and more. Just let our staff know any personal preference and we can tailor your menu to your liking. Because we are experienced in slow cooking delicious barbeque and provide various side options, you can rest assured you’re getting exactly what you want with our services. Our BBQ foods are all cooked to perfection, and our chefs slow cook each meat so BBQ is extra juicy, seasoned, and flavorful Our clients are in for an appetizing treat with our BBQ. Having great food truly makes or breaks an event. 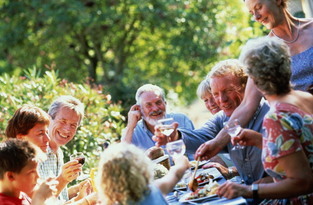 Our BBQ will bring your guests together for a great time of mingling and making memories. Your food presentation and service can be as formal of service as you would like, or we also offer a buffet style service option with food service trays for all of your guests to choose from for a variety of delicious BBQ options to enjoy! Our food service and catering staff is also fully equipped to serve large parties efficiently so that food is served hot and fresh, and they will also ensure that any beverage, appetizer and dessert bars are fully furnished for your guests. Our prices are affordable, and we always offer quick and efficient setup, and will follow any instructions in terms of setup logistics and preferences that you might have. We are also able to handle any last minute orders and coordinating requests to assist you in making your event super special. We pride ourselves on serving delicious, perfectly cooked, and savory BBQ. When we serve our mouthwatering brisket, sausage, turkey, ribs, chicken and pork loin, we take the extra time to prepare truly amazing BBQ. Let us prove how delicious our BBQ is by booking us for your next event! There’s nothing more mouth-watering and filling than true authentic barbeque. 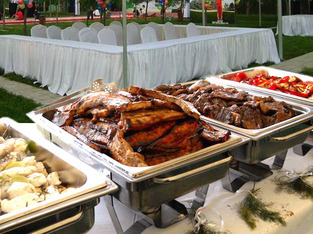 With our superior catering services, Niagara Catering is your provider for amazing, great tasting barbeque. 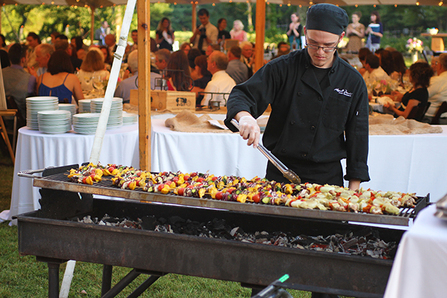 Let us serve at your next event, and our barbeque is sure to be a crowd pleaser. Please call us at 289-273-2266 or fill out the form at the top right hand of your screen to discuss how our Niagara Wedding Catering Service can best meet your catering needs!